A PET/CT scan is a powerful diagnostic examination which combines functional information (PET) with structural information (CT) in one examination. The PET (Positron Emission Tomography) part of the test uses a radioactive form of sugar which is administered intravenously and taken up by the tissues in your body. It allows doctors to visualise the function of tissues and organs and can pinpoint the increased activity of cancer cells. The special low radiation dose CT scan provides the relevant anatomical information which demonstrates the position of cancer cells. This allows therapy to be optimised. How can I prepare for my PET/CT scan, is there any special preparation? Yes, you will need to fast for at least six hours prior to your appointment. You will be asked to drink one litre of water in the two hours before your appointment. You may empty your bladder as normal before your appointment time. Please wear loose, warm, comfortable clothing to your appointment. Please avoid garments with zippers or buttons. Please continue to take all medications as normal. What happens when I have the scan? When you arrive for your appointment we will ask you to provide a finger prick sample for a glucose check. Our staff will go over your preparation and this is a good time to discuss any questions or concerns you have with them. An intravenous cannula (small needle) will be placed in your arm and the tracer will be injected. You will then be required to rest in a quiet, dimly lit room for at least one hour before your scan. During this time it is important that you relax, keep still and not speak. During the scan you will lie flat on the scanner table. It is important to lie completely still during the procedure. No parts of the scanner will touch you but it will make a humming or whirring noise. This is completely normal. The low dose CT scan will be performed first followed by the PET study and the images will be matched up and reported together. If you require a separate diagnostic CT scan this will be performed after the PET/CT study. A small amount of CT contrast will be injected via the same cannula in your arm and you may experience a very temporary warm flush or metallic taste in your mouth. This is completely normal. After the study you may be asked to stay in the department a short time whilst the images are checked. You can eat and drink normally during this time. The glucose tracer and CT contrast will pass out of your body via your urine over the next eight or so hours so please drink plenty of fluids to assist this. 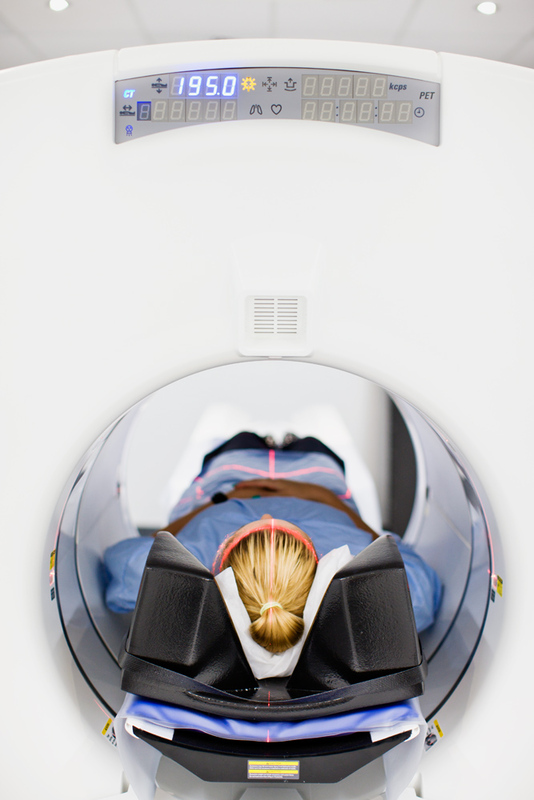 A PET/CT scan is a safe routine diagnostic test that uses small amounts of radiation. The radioactive glucose is safe and has no known side effects. If you need an injection of CT contrast you will be asked some questions about any previous reactions to iodine prior to the scan being performed. If you think you might be pregnant you must tell your referring doctor and our staff prior to your examination. You will be in the radiology department for between two to three hours. The actual scan will take between 20 and 30 minutes to perform. As you can appreciate a lot of different images and information is gathered during a PET/CT scan and these need to be carefully reviewed by a Radiologist or Nuclear Physician with special training and experience in PET/CT. The results should be available to your referring doctor no later than 48 hours after the examination. Please make an appointment with your doctor to discuss your results. If the reason for your PET/CT is eligible for a Medicare rebate then the total cost of the PET examination will be covered by Medicare and you will have NO out of pocket expenses. However, in some instances the scan may not be covered by Medicare so please check with our staff prior to your appointment to see if you are eligible for a Medicare rebate. If the scan is not covered by Medicare you will be responsible for the full cost of the study.